Finally, I have a new hat. This project took weeks of research, planning, buying of pink yarn, swatching and buying of more pink yarn; but only a few days of knitting. I just love it. It’s based on the ‘Red Palm’ chart from the Bohus book. I simplified the chart a little. 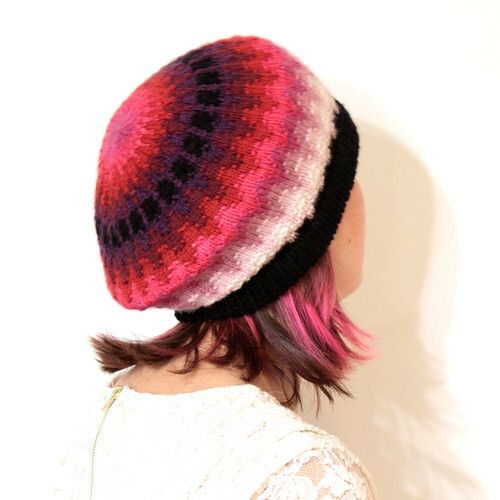 My hat is knitted in a DK weight with a folded, 1×1 rib band. I improvised the pattern over the decreases. I use this crown decrease calculator to plan the shaping to the top of the hat, but it was way off. I re-knit the crown 3 times, changing the decrease rate, to get it to lie flat. Even then, it took some aggressive blocking. I can’t say what went wrong, the maths looked sound, it should have produced a flat circle. Perhaps the purl stitches did unexpected things to the gauge. Never mind, it was all OK in the end. It seems a little lonely on its own. Would a matching scarf, mittens and leg warmers be overkill? 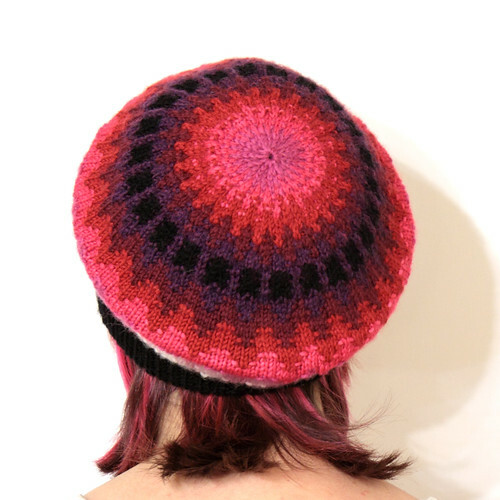 Also, pompom – yea or nay? That’s just beautiful! I love it as it is, no pompom but that’s just my taste. Scarf etc. sound great to me and you can pick and choose then which you want to wear together. The chart/stitch effect has so much potential, it would be amazing on a waterfall style cardigan (though would depend on how the back looks, and might take forever!). ThAt is just too ute! And it matches your hair, too. I love it. Great job.